How Much is a Copy of Hitler's Mein Kampf Worth? Pamela is the author of three books and has written 400+ articles on antique collecting for The Spruce Crafts. Adolf Hitler epitomizes evil for many, and military memorabilia dealer Craig Gottlieb will be the first to acknowledge that point. He also knows that some people find anything associated with the Führer or Nazi Germany to be “downright creepy.” But Gottlieb believes historically significant items, even those belonging to Hitler, offer learning opportunities and should be preserved and displayed rather than destroyed and forgotten. Proving this point, Gottlieb, known for his expert consulting on militaria for the hit History Channel program Pawn Stars, auctioned off Hitler’s personal copy of Mein Kampf through his website at historyhunter.com in 2014. This 1932 edition bears Hitler’s own bookplate inside the front cover and is presumed to be the only author-owned copy in existence. The impact Mein Kampf – which translates to “my struggle” – had on world history is not disputable. Had more people read this book back in the day, they would have had no doubt about Hitler’s intentions detailed implicitly in this “autobiographical manifesto,” as it is described in a news release distributed by Gottlieb’s publicists. The book written in 1923, and first published in July of 1925, outlines Hitler’s political ideology and future plans for Germany. The copy Gottlieb offered at auction was part of a group of Hitler’s personal belongings liberated from the Nazi leader’s Munich apartment in 1945 by United States Army First Lieutenant Philip Ben Lieber. 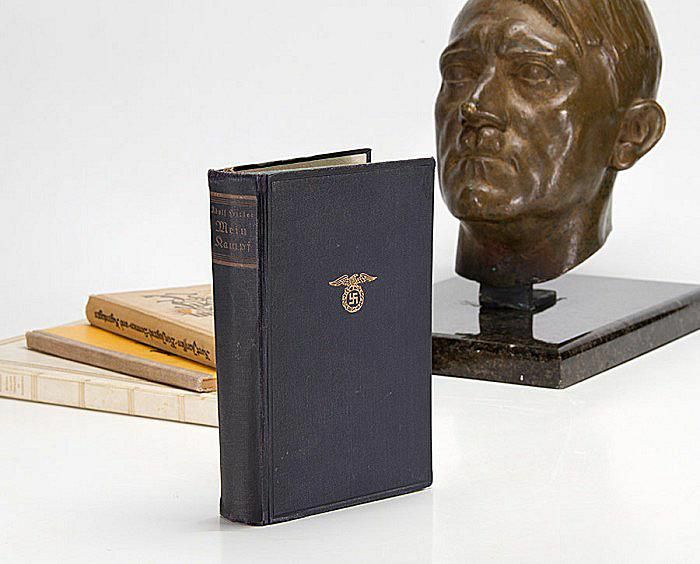 This book, along with others from Hitler’s library, was sold to Gottlieb in 2013 along with a hat, shirt, medals, and a number of other items. This copy of Mein Kampf was the first item from this collection to be offered for public sale. Others have been sold privately to collectors who are students of human nature and value the study of history. "This artifact is historically significant and I would love to see it go to a museum," Gottlieb added. He acknowledged, however, that market realities will probably influence this copy of Mein Kampf going to a collector who appreciates its place in history. Gottlieb also plans to donate a portion of the proceeds from the auction to a Jewish charity. Being Jewish himself, he qualifies this as “historic irony” and relishes being able to funnel support to an organization fostering education about the Holocaust by selling an artifact written and formerly owned by none other than Hitler. Gottlieb notes that Mein Kampf originals dating from the 1920s through the end of World War II are readily available on the market since so many of them were originally printed. Collectors wanting a copy can easily find a basic 1932 edition similar to the one that Gottlieb auctioned for about $200. But the Hitler-owned version offered for sale was not an average example. Provenance is the key to high value in this instance. The book is described and mentioned in several key documents in his possession, copies of which will be included with the book’s sale. Gottleib predicted that this rare copy could exceed $100,000. But when the hammer fell, the book sold for $28,400 with no buyer's premium. Signed copies of Mein Kampf with authenticated autographs have sold for $65,000-70,000 in the past, but those were not personally owned by Hitler like this one. Time will tell if this copy will be resold by the buyer in another venue for an even higher amount.